Red and silver leather bound book with figure of Alice on front and back in linen painted with watercolour, padded and embroidered. 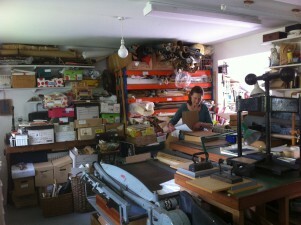 Contained in a box lined with blue velvet and covered in marbled paper with red leather spine. Bound in dark red oasis inlaid with silver kid. Figure of Alice in linen painted with watercolour, padded and embroidered and set into recessed boards. She steps over a strip of marbled paper denoting the mantle-piece. Contained in a drop back box covered with marble paper; dark red oasis spine with the title in gold tooling; lined with blue velvet. Commissioned by the Crafts Advisory Committee (precursor to the Crafts Council) on the occasion of`The Craftsman's Art' exhibition at the V&A, 1973. 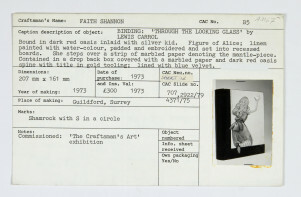 Through The Looking Glass, Faith Shannon, 1973, Crafts Council Collection: B5. Photo: Todd-White Art Photography.